"Event" redirects here. For the events that occur randomly in Smash Run, see Smash Run. Event match (イベント戦, Event Battle) is a single-player mode found in all Super Smash Bros. games starting with Melee. Event matches are challenges that place the player into specific scenarios with special conditions and a certain objective to meet, many of which pay homage to the characters and their history. Each game records the completion and "score" of each event match. 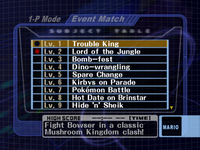 The Melee event match menu, with the first nine event matches visible; the red dots indicate events that have been cleared. Event matches were introduced in Super Smash Bros. Melee, as part of the game's single-player mode. Only 10 are initially available to the player, with the rest appearing as the player fulfills a number of other objectives in the game. There are a total of 51 event matches in Melee. A majority of Melee's event matches allow the player to select their character, although several of them require the use of a specific one. Of note is that, with the exception of Pikachu, all of Smash 64's "Original 12" characters have their own dedicated event match. Unique to Melee's event matches, compared to its other single-player modes, is that some matches require players and opponents to use an alternate costume. Also of note is that no healing items appear in any of the event matches, although Mr. Game & Watch's Judgement 7 will still drop a Food item. A completely new set of 41 solo event matches appeared in Super Smash Bros. Brawl, alongside a separate set of 21 co-op event matches. Brawl also introduced three difficulty levels for each event match: Easy, Normal, and Hard. The player starts with 10 solo event matches and 8 co-op event matches. Unlike in Melee (where most of the events allow the player to choose any character), almost all of Brawl's event matches have an assigned character. Only the All-Star Matches and the final two solo and co-op event matches allow the player to choose a character. This appears to be done so that players are required to use nearly every character at least once. Luigi and Jigglypuff lack an assigned solo event match, but they appear as assigned characters in co-op events. The Super Smash Bros. for Wii U event match menu. Event matches and co-op event matches return in Super Smash Bros. for Wii U and function similarly to those in Brawl, but are now arranged on a map instead of a linear list. Completing an event will unlock paths to more events on the map. Each event will yield a reward if completed under specified conditions, such as playing on a certain difficulty and/or achieving a certain score. Additionally, scores earned will overwrite any inferior scores of lower difficulties; for example, completing an event on Normal difficulty in 30 seconds will also set the Easy difficulty's score to 30 seconds if it was slower or blank. Most events allow the use of customizations, but equipment that allows players to start a match with an item will have its extra effect negated; for an example, Beam Sword equipment will not allow the player to start matches with the Beam Sword in any event match. Players can now use different alternate costumes for most character-specific events by picking customized characters who wear them. All event matches must be unlocked by completing other events, with the only exceptions being the starter events: "The Original Heavyweights", located in the center of the solo events screen, and "A Lurking Menace", located in the top-left corner of the group events screen. Some events also have "hidden routes" that become available if certain characters (or, in the case of The Ultimate Battle, all characters) are unlocked. As for the maps below, each color represents rewards for each event completed. Yellow means gold, light green means a Crazy Orders pass, and dark green means a trophy. Any path showing a character's icon means that particular character needs to be unlocked before that event can be unlocked. Event matches as a separate mode do not return for Ultimate. However, Spirits Matches feature similar fights with unique conditions. In addition, fights in various fighters' Classic Mode routes have unique conditions similar to those of event matches. In the Wii U version, all randomized stages will have a consistent layout across matches until the player leaves the Event screen. For example, Gamer will always have the same objects and Port Town Aero Dive will always stop at the same places. Brawl is the only game in the series in which none of the event matches involve fighting bosses, aside from minor bosses such as Giant Bowser and Giant DK. This page was last edited on March 19, 2019, at 07:54.